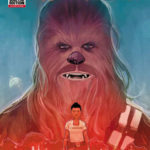 Just announced- My pal Gerry Duggan and I will bringing a Chewbacca mini-series to you starting in October. Rawwwrrrrrr!! !